For planed and callipered blocks add 20% additional for labor. Un-planed balsa blocks are straight from the mill and are not perfect. Un-planed balsa blocks may have saw marks or band saw marks on a side or two from the milling operation and may not be square. All un-planed blocks are usually close to the listed length, width, and depth but are occasionally + or -1/8 inch because of conversions from English to metric in some of the milling shops. If exact lengths, widths, or depths are crucial to your order please specify this in the comment box below for 20% extra and we will meet your needs. 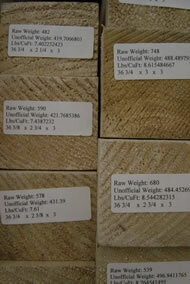 Balsa Blocks or planks are 1x1 inches or larger chunks of balsa. Balsa can vary between 3# (foam weight) - 40# (oak weight) for pounds per cubic foot (lbs/cuft) but the most common densities are 8-16 pounds per cubic foot. 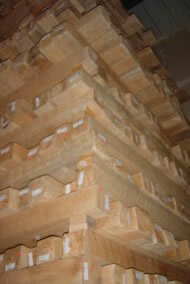 We can also dimension the blocks to most any size. Balsa blocks are used for carving of decoys, statues, toys, industrial projects, airplane parts, and decorations. Normally the biggest balsa blocks we get in are 3x4 un-laminated. If you require something larger than 3x4 un-laminated mention it in the Order Notes below and there is a 50% additional fee. For most balsa blocks larger than 3x4 we usually have to laminate from a few smaller blocks to make the larger sizes. The blocks turn out square and smooth after the lamination process. We use waterproof polyurethane glue with clean fitting glue joints. We have the ability to laminate balsa blocks to most any size required. For example a 6x12x36 inches is small enough that we can dimension it smooth and square. Largest size that can be dimensioned is approximately 48 inch wide x 12 inch thick x any length. Larger blocks can be done but they will have polyurethane glue along all of the laminated seams. 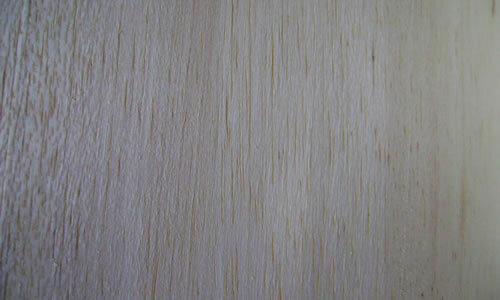 All laminated joints are smooth without any gaps and are made with waterproof glue. Include in the Order Notes message box below any laminated block sizes or any special requirements that you will need quoted for your order. Size Inches 6" 12" 18" 24" 36" 48"